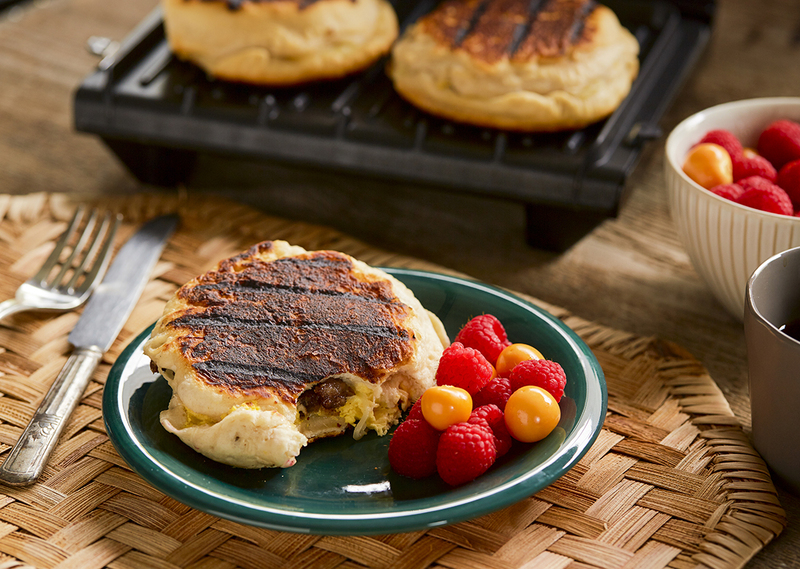 Go-To Breakfast: A perfect on-the-go breakfast sandwich for those rushed mornings – Prep these pockets ahead of time and stash away for an easy and quick breakfast. In a large sauté pan, melt butter over medium heat. Add beaten eggs and scramble until just cooked through, about 2-3 minutes. Remove scrambled eggs from heat and season with salt and pepper. Lightly flatten (with either rolling pin or fingers) biscuits until about 4½” in diameter. Place slice of cheese on top of 4 of biscuits. Layer with sausage and scrambled eggs and top with one more slice of cheese. Place remaining biscuit over top, folding bottom biscuit over edges of top biscuit to create a pocket. Press edges closed with fingers or fork. Place breakfast pockets on preheated grill and close lid. Grill for 8-10 minutes until biscuits are cooked through. Repeat with any remaining breakfast pockets. Enjoy on the go, or see below for meal prep. If making ahead, allow pockets to cool completely and individually wrap in plastic wrap. Place in zip top freezer bag and place in the freezer. To eat, remove from freezer and plastic wrap. Wrap in paper towel and place on microwave-safe plate. Microwave for 2-3 minutes until the inside is hot.